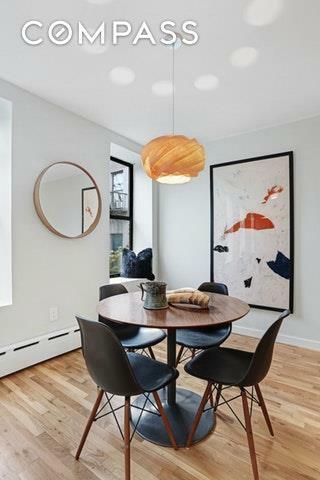 MANHATTAN CHIC MEETS BROOKLYN COOL in TRENDY BED-STUY*** ONLY 30-MIN subway ride to Financial District/Manhattan!! 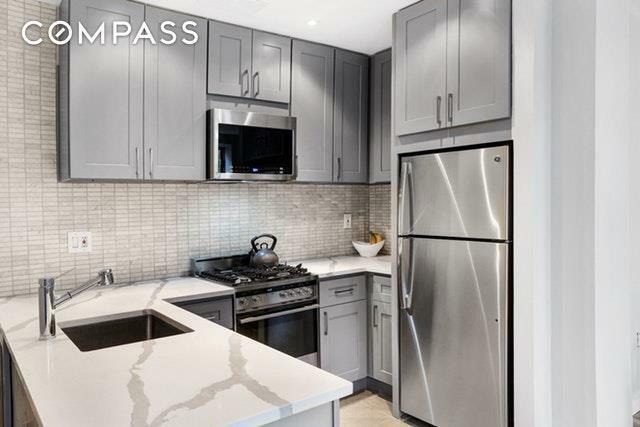 *** LESS THAN $400/month in taxes and condo common charges!! *** INVESTORS: 4.6% return if converted into a 3-bedroom and rented for $2500/month with HUGE appreciation potential in the area over the next few years! 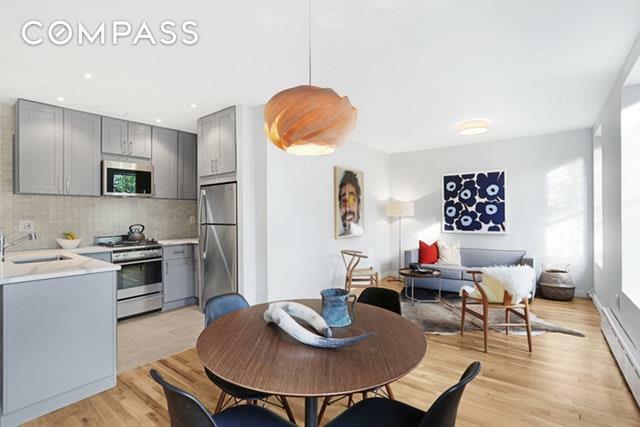 !Be the first to live in this designer-renovated luxury apartment in vibrant Bed-Stuy! This fully renovated 2-bedroom (easily convertible to 3-bedroom) 1-bathroom apartment features 3 exposures (North, East and West) and is flooded with gorgeous light throughout the entire day.Youll fall in love with the main living/dining/kitchen space with 4 LARGE WINDOWS looking out onto tree-tops and back gardens. So serene! The details and finishes in this apartment are absolutely beautiful and similar in quality to luxury new developments in Manhattan.No detail has been over-looked from the sleek custom kitchen with high-end stainless-steel appliances including dishwasher, imported marble countertop and Carrera marble backsplash, to the gut-renovated bathroom with floor-to-ceiling tiling, marble vanity and Carrera marble floors, to the professionally refinished solid oak wood floors and modern baseboards.The apartment offers great closet space and the two well-proportioned bedrooms are also flooded with breathtaking light and have views of the Manhattan skyline.The well-managed building offers a newly renovated laundry room, common courtyard, storage and VERY LOW MONTHLY taxes and condo common charges.NEIGHBORHOOD/COMMUTE6 SUBWAY LINES within 5-10min walk (A/C, J/M/Z and L) and ONLY a 30-min subway ride to Financial District/Manhattan and a short ride to Williamsburg, Dumbo, Downtown Brooklyn and all that makes Brooklyn so awesome.The neighborhood is becoming increasingly desirable due to its ease of access with 5 subway lines and the influx of cafs and restaurants, and is considered one of Brooklyns new exciting neighborhoods. 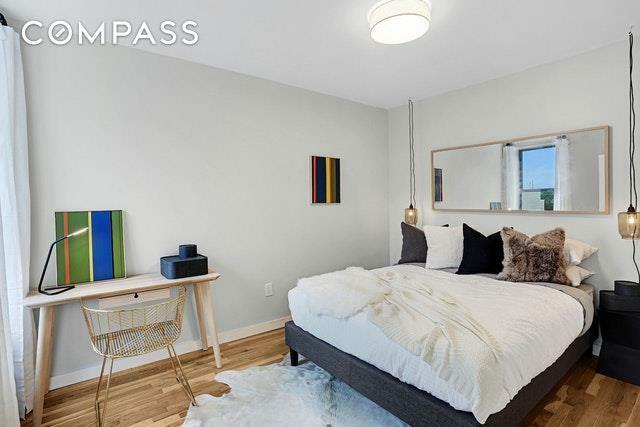 Right now is the time to buy before prices go up in this area.Youll find many cool cafes and restaurants in Bed-Stuy and gourmet grocery stores are as close as 5-10min walk from the apartment. Listing courtesy of Ali Ebrahimi of Compass.